In order to fully understand the seriousness of the Ecumenical Patriarch's actions in Ukraine, and why they are so reckless, you have to understand who the people are that the EP has decided to join himself to. "In response to the corresponding telegram and letter of Your greatly beloved and honorable Beatitude on the problem that has arisen in Your Holy Russian sister Church that led her Holy Synod, for reasons known to her, to the deposition of the until-recently leading member of her Synod, Metropolitan Philaret of Kiev, we desire to fraternally inform Your love, that our Holy Great Church of Christ, recognizing the fullness of the Russian Orthodox Church’s exclusive competence on this issue, synodally accepts the decisions regarding the one in question, not desiring to bring any trouble to Your Church. 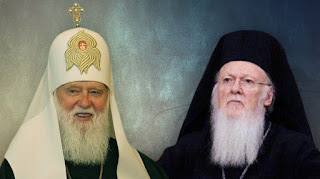 It is precisely in this spirit that we sent two brothers, His Eminence Metropolitan John of Pergamon and His Grace Bishop Vsevolod of Skopelos, after a visit to us by the one in question who has been deprived of his office, that we could be directly notified firsthand of what had occurred and avoid a misinterpretation in the given case. Consequently, we should note that we were grieved when we learned that there was not a full understanding of the purpose of their mission" (Letter of His All-Holiness Ecumenical Patriarch Bartholomew to His Holiness Patriarch Alexei II of Moscow and All Russia, August 26, 1992, emphasis added). See also: The Official History of the Defrocking and Anathematization of Philaret Denisenko: Documents of the June 1992, 1994, and 1997 Bishops’ Councils of the Russian Orthodox Church. "If anyone who is a clergyman pray in company with a deposed clergyman, he shall be deposed too" (D. Cummings, trans., The Rudder of the Orthodox Catholic Church: The Compilation of the Holy Canons Saints Nicodemus and Agapius (West Brookfield, MA: The Orthodox Christian Educational Society, 1983), p. 23). Canon 16, says that if a clergyman is suspended or deposed, and goes to another bishop, and "the Bishop with whom they are associating, admits them as clergymen in defiance of the deprivation prescribed against them, he shall be excommunicated as a teacher of disorder." (Ibid., p. 27). “Having received notification of the mentioned decision, we informed the hierarchy of our Ecumenical Throne of it and implored them to henceforth have no ecclesial communion with the persons mentioned” (Letter of His All-Holiness Ecumenical Patriarch Bartholomew to His Holiness Patriarch Alexei II of Moscow and All Russia, April 7, 1997). And this means very clearly that the EP has knowingly joined himself to a justly deposed and anathematized bishop, along with the schism that he established. "As for all those persons who enter the church and listen to the sacred Scriptures, but who fail to commune in prayer together and at the same time with the laity, or who shun the participation of the Eucharist, in accordance with some irregularity, we decree that these persons be outcasts from the Church until, after going to confession and exhibiting fruits of repentance and begging forgiveness, they succeed in obtaining a pardon. Furthermore, we decree that communion with those excluded from communion is not allowed, nor in another church is it to be allowed to admit those who have no admittance to another church. If anyone among the Bishops, or Presbyters, or Deacons, or anyone of the Canon, should appear to be communing with those who have been excluded from communion, he too is to be excluded from communion, on the ground of seemingly confusing the Canon of the Church" [Ibid., p 535, emphasis added]. "If any Bishop, deposed by a Synod, or any Presbyter, or Deacon, deposed by his own Bishop, should dare to perform any act of the liturgy—whether it be the Bishop in accordance with the advancing custom, or the Presbyter, or the Deacon, let it no longer be possible for him to have any hope of reinstatement even in another Synod (or Council), nor let him be allowed to present an apology in his own defense, but, on the contrary, let all of those who even commune with him be cast out of the Church, and especially if after learning about the decision pronounced against the aforesaid, he should dare to commune with them" (Ibid., p 536, emphasis added). This canon makes it clear that Filaret, by continuing to serve after he was deposed, placed himself beyond the possibility of being reinstated by any subsequent Council. Furthermore, by entering into communion with Filaret, the Ecumenical Patriarch has committed an offense, for which he should be not only deposed, but cast out of the Church entirely. We have already covered the EP's bogus claims to have jurisdiction over Ukraine (see What's Going on in Ukraine? Part 1: The Historical Background), a claim one of his own bishops has dismissed as contrary to history (See: Met. Kallistos (Ware): "I am not at all happy about the position taken by Patriarch Bartholomew"). But the EP claims to have some prerogatives that give him rights to intervene in Ukraine, by virtue of the fact that he is the first bishop in the diptychs of the Orthodox Church, so let's consider whether these claims hold up any better. Archpriest Andrei Novikov, has made the case, in great detail, as to why the Neo-Papal claims of the EP are without basis, in his essay: The Apotheosis of Eastern Papism, but let me highlight the most important points he makes. For one, the EP is making claims that closely mirror the claims of the Pope, and if these claims were consistent with Orthodox ecclesiology, one would have to wonder why were weren't still under the Pope of Rome. "If any Clergyman has a dispute with another, let him not leave his own Bishop and resort to secular courts, but let him first submit his case to his own Bishop, or let it be tried by referees chosen by both parties and approved by the Bishop. Let anyone who acts contrary hereto be liable to Canonical penalties. If, on the other hand, a Clergyman has a dispute with his own Bishop, or with some other Bishop, let it be tried by the Synod of the province. But if any Bishop or Clergyman has a dispute with the Metropolitan of the same province, let him apply either to the Exarch of the diocese or to the throne of the imperial capital Constantinople, and let it be tried before him" (Ibid., p 253). "So it is evident that the Canon means that if any bishop or clergyman has a dispute or difference with the Metropolitan of an exarchy, let him apply to the Exarch of the diocese; which is the same thing as saying that clergymen and metropolitans subject to the throne of Constantinople must have their case tried either before the Exarch of the diocese in which they are situated, or before the Bishop of Constantinople, as before a Patriarch of their own. It did not say that if any clergyman has a dispute or difference with the Metropolitan of any diocese or parish whatever, they must be tried before the Bishop of Constantinople... That is why Zonaras too says that the Bishop of Constantinople is not necessarily entitled to sit as judge over all Metropolitans, but (only) over those who are judicially subject to him (interpretation of c. XVII of the present 4th C.). And in his interpretation of c. V of Sardica the same authority says: "The Bishop of Constantinople must hear the appeals only of those who are subject to the Bishop of Constantinople, precisely as the Bishop of Rome must hear the appeals only of those who are subject to the Bishop of Rome" (Ibid, p. 253). If one does not read these canons as St. Nicodemos suggests, it is possible to conclude that Constantinople could have even overruled Rome, something that the pre-Schism Roman church would never have accepted, nor is it likely that any other patriarchate of that time would have either. Within the context of the principle that Constantinople should have "equal prerogatives" to Old Rome, however, this has been interpreted to mean that Constantinople may be the highest court of appeal in the East (in those provinces belonging to his patriarchate) as Rome was in the West. "It has pleased this Council to decree that if any Bishop be indicted, and the Bishops of the same diocese remove him from his rank, and by way of appeal, he has recourse to the most blessed Bishop of the Church of the Romans, and the latter expresses a desire to hear the matter through and deems that it is right and just for the trial of the case to he reopened, let him write to these Bishops and request those who are close to the province in question to make a searching investigation of the points in the case with due diligence and accuracy, and in accordance with faith in the truth pronounce a decision regarding it. But if any person demands again to have his case heard and sees fit to request that it be tried by the Bishop of the Romans, let the latter send Presbyters from his own flank, in order that he may be in the authority of the Bishop himself. If he rules that it is right and decides that judges ought to be sent to try the case together with the Bishops and to exercise authority derived from the one who sent them, then let this too be done. But if he deems the verdict and decision in regard to the Bishop’s case to be sufficient, let him do whatsoever may seem best to his most prudent sense of discretion" (Ibid., 586). As can plainly be seen, the right of appeal did not entail Rome arbitrarily overturning the decision of a local Synod, without hearing out all of the parties, and allowing them to participate in the hearings. At no point were any of these steps laid out by this canon followed by Constantinople. No opportunity to testify or present evidence was given to the canonical Church in Ukraine, or to the Russian Church as a whole. Furthermore, Constantinople already had twice rejected the appeal of Filaret. Only if we grant the Ecumenical Patriarch powers that even the Pope was too ashamed to have claimed, would we be able to say that he has acted justly here. There are no canons which would support the course he has taken in Ukraine.